Boland Hall is our largest building on campus, holding 700 first year students. Boland Hall is divided into two halves: Boland North and Boland South. The north side has suite style living with up to 6 suite mates of the same gender sharing one bathroom in one suite. Residents are responsible for cleaning their own bathrooms in the north side. The south side is community style living with a community of about 30 people sharing a very large bathroom. University Housekeeping staff keep the south side bathrooms clean. Boland Hall is also home to the Pirate’s Cellar, the largest lounge in a residence hall. In the Cellar there are pool tables, a Foosball table, soft seating, tables for studying and a large TV. Classrooms BH 34 and 35 are located in the back of the Pirate’s Cellar. Tutors in Residence have an office near the main lounge on the first floor. Our partners in Campus Ministry and DOVE are also housed in Boland Hall. Community members can get to these offices via the door in the Campus Ministry Courtyard. The front desk is staff 24 hours a day, there are 19 resident assistants and 2 professional staff members who oversee Boland Hall. Just a friendly reminder that we will be welcoming future Pirates to campus on Sunday, February 18th! Future Pirates and their families will be given tours of campus, and RAs will be leading Residence Hall tours in Boland, Aquinas and Xavier. 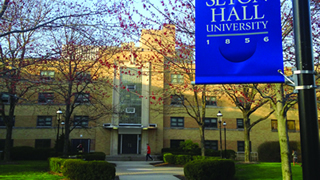 We encourage the SHU community to be welcoming to our guests! 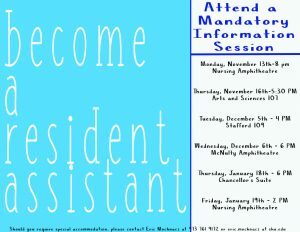 Resident Assistant applications are due tomorrow! Any student who has expressed interest in becoming a Resident Assistant for the 2018-2019 academic year should submit their application and resume by tomorrow, Friday, January 26th by 12 noon. E-mail invites to Group Process will be sent no later than Monday, January 29th. Group Process will take place on Friday, February 9th from 5 pm to 8 pm. Students who perform well in Group Process will be invited to sign up for an interview the week of February 12th for an interview held the week of February 19th. All candidates should check their Seton Hall E-mail periodically for updates, including any changes in scheduling due to inclement weather. Good luck to all out interested students! Author Eric MochnaczPosted on January 25, 2018 January 25, 2018 Categories Out of state, RAs, StaffTags deadline, freshmen, Parents, programming, RA, RA Selection, Resident AssistantLeave a comment on Resident Assistant applications are due tomorrow! This month, meet two of our returning Resident Assistants. Over the past few months, we’ve shone the spotlight on student staff who are serving in their first year as Resident Assistants, but we also have RA’s who choose to apply for a second or third (maybe even fourth!) year to continue to serve the students in our residence halls. Jen, originally from Lebanon, entered her second year as an RA in the Complex. Jen is no stranger to hard work, as she currently manages a Biology major, a Psychology minor and a Catholic Studies minor. When she isn’t pursuing her career and applying for accelerated Nursing Master’s programs, she is actively involved in Campus Ministry as a work study and as an active participant in St. Paul’s Outreach programs. Jen believes she is “called to help people” and puts that calling into action by serving at a local soup kitchen weekly and putting her energies into the RA position. Jen also has an adventurous side, having bungee jumped last summer and planning to skydive for her 21st birthday. 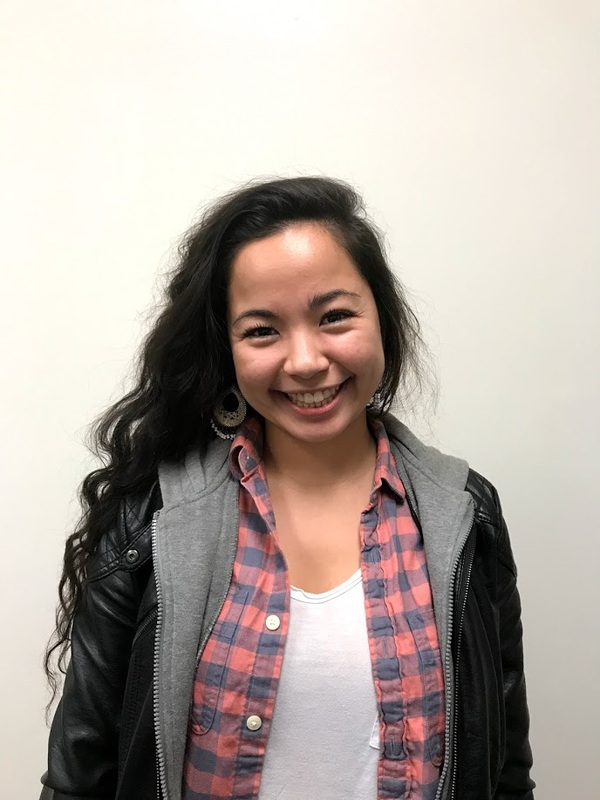 In the RA position, Jen loves building community and creating unique, positive, and quality relationships with and between the students on her floor. Jen reflects on her first program ever as an RA as one of her successes in the position. Hosting a “Detox and Destress” program, she invited over 100 residents to enjoy smoothies, bubbles, and other stress relief activities. Jen loves the RA position because it’s constantly evolving and unpredictable. If you want to join Jen as an RA next year, she recommends knowing who you are and being uniquely you throughout the entire interview process. Dwyght is a rare RA, potentially looking to return for a fourth year. Having served the students in Complex for two years, he has embraced working with first year students in Aquinas Hall. Dwyght is proud of his membership in Sigma Pi fraternity and is actively engaged in the entire Seton Hall Greek community as the Vice President of Marketing for the Inter-Fraternity Council here at SHU. Dwyght, who is originally from Massachusetts, credits his RA, Doug Stringham, with influencing him to apply for the position. Dwyght, with Doug’s encouragement, was able network on his floor and throughout the building, stepping outside the comfort zone of his room. Dwyght applies this lesson in helping his eager first year students make the most out of their Seton Hall experience. His desire to return to the position for a fourth year is driven by the desire to impact students’ lives. As for those who want to be an RA, Dwyght wants you to know that you don’t need to be a social giant, but you need to have a genuine desire and ability to build meaningful relationships with students in your building. Housing and Residence Life will be hosting two more information sessions in January for students who want to be like Jen and Dwyght! They will be held on Thursday, January 18th at 6 PM in the Chancellor’s Suite and on Friday, January 19th at 2 PM in the Nursing Amphitheatre. Author Eric MochnaczPosted on January 3, 2018 December 15, 2017 Categories RAs, Residence Halls, Staff, UncategorizedTags Housing, RA, RA Selection, residence halls, Resident AssistantLeave a comment on Meet January’s Featured RA’s! Housing and Residence Life is happy to introduce this month’s featured Resident Assistants. Zachary Case and Jonathan Veenstra each joined staff this fall and work in Complex and Xavier Halls respectively. As fate would have it, they are both founding fathers of Phi Delta Theta fraternity here at Seton Hall! Zach, who laughed throughout our entire interview and swears he is “always happy”, comes to Seton Hall from South Brunswick, NJ. He is an Accounting major with a minor in Spanish. When he isn’t serving as an RA or a founding father of Phi Delta Theta, which Zach says takes up the majority of his time, he enjoys watching “Riverdale” and “Survivor” and playing on his intramural volleyball team. Zach credits his RA, Tim, helping him through the adjustment of living with someone for the first time as his motivation for applying for a position. He wanted to help people like his RA helped him. Zach also loves the community he has established among the other RA’s on his staff, knowing that he can always count on a fellow RA to grab a meal with him in the dining hall. Zach, who works with students in our upperclass area, finds it easier to build relationships with his residents because they are familiar with campus and how they can utilize the RA. 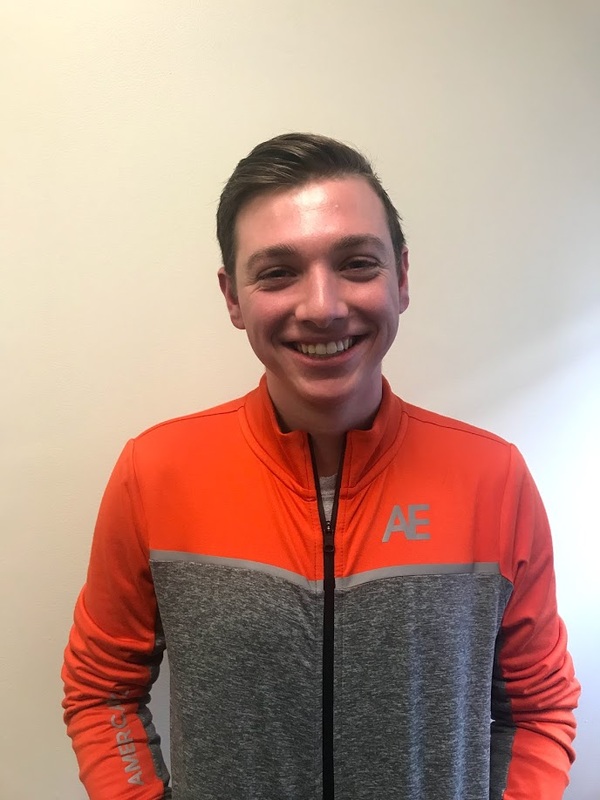 Zach encourages anyone going through this year’s RA selection process to be confident through the interview process and acknowledges that being selected from the alternate roster and hired as an RA has helped him become more confident in himself. Where Zach enjoys volleyball and Netflix, Jon is a true blue Pirate Blue fan, splitting his time between being an RA in Xavier Hall and serving as one of the managers of the men’s basketball team. Jon’s passion for basketball is present in every aspect of his life, including academics, as he is a Sports Management major with hopes to take on Sports Media as a double major. Originally from North Haledon, Jon always has a built in “fun fact” for icebreakers because he is a triplet. 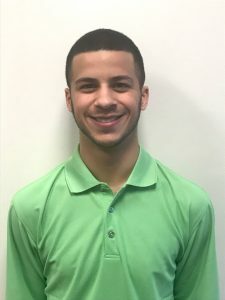 Jon chose Seton Hall because of its reputable Sports Management program and can’t help but acknowledge his favorite color is blue, so SHU is a natural fit for him. Jon doesn’t believe you need to be an “in your face” person to be a successful RA. He channels his energies by being a quiet presence on the staff, making himself available and creating a safe space for his residents. They’ve seen his efforts and celebrated him when his “12 Dogs of Christmas” bulletin board won bulletin board of the month which made him feel good about the community he has created. Jon encourages anyone who is even considering the RA position to apply, because that’s the only way you’ll be able to learn about yourself throughout the interview process. Housing and Residence Life will be hosting four more information sessions if you’re interested in joining the RA staff for 2018-2019. 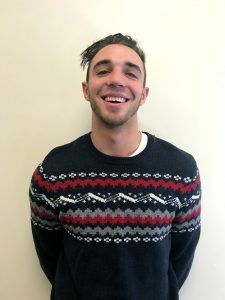 Author Eric MochnaczPosted on December 1, 2017 December 15, 2017 Categories RAs, Residence Halls, StaffTags freshmen, Housing, RA, RA Selection, residence halls, Resident Assistant, SpringLeave a comment on Meet December’s Featured RA’s! Meet Teresa and Ryan, November’s Featured RA’s! 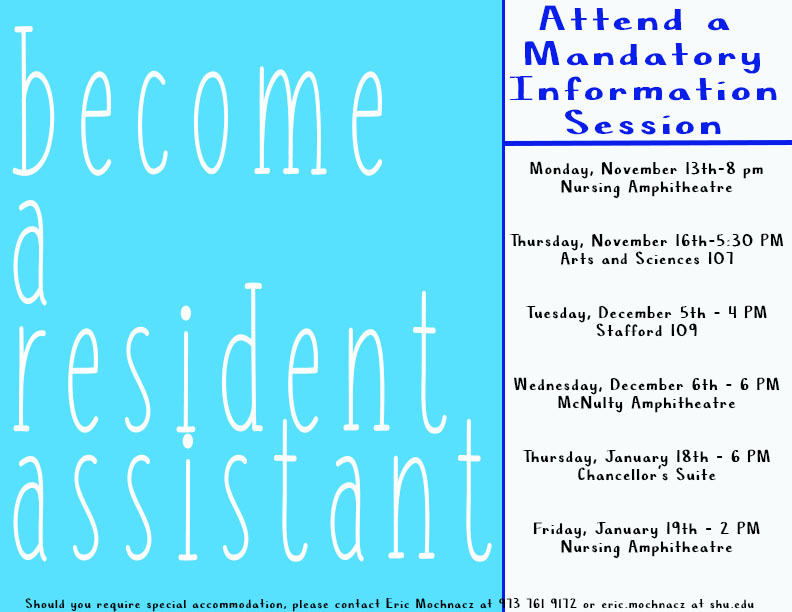 Monthly, Housing and Residence Life is taking the time to get to know some of the Resident Assistants (RA’s) on staff and share these profiles with you. RA’s are student leaders who live in the residence halls to build community, offer programs, serve as a resource to students, and address any issues students experience. This month, we meet Teresa Holl, a Sophomore “Jersey Girl” from Jackson who works as an RA in Ora Manor, our University-owned apartment complex on Valley Street. Teresa’s path to being a Resident Assistant wasn’t always clear, as she had considered transferring after a short while at Seton Hall. 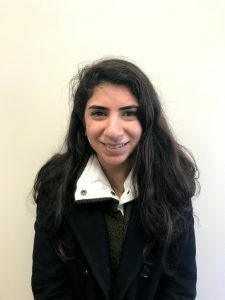 However, she credits her freshman year RA, Heather Kwityn, for connecting her to SHU and motivating Teresa to pursue a position with Housing and Residence Life. A Nursing major, Teresa saw the RA position as a chance to continue her leadership experience from high school. Teresa loves bringing her organizational skills to her small staff and works to fight the stigma associated with being an RA off campus. She values having her own living space and the ability to build more mature relationships with her residents and co-workers. Teresa speaks happily about integrating her Filipino culture into her community, hosting a program where her aunt and uncle provided Filipino food from their restaurant. If you’re interested in becoming an RA, Teresa encourages you to go for it and be yourself! Next up is Ryan Johnson, a first-year RA from the first floor in Boland Hall. 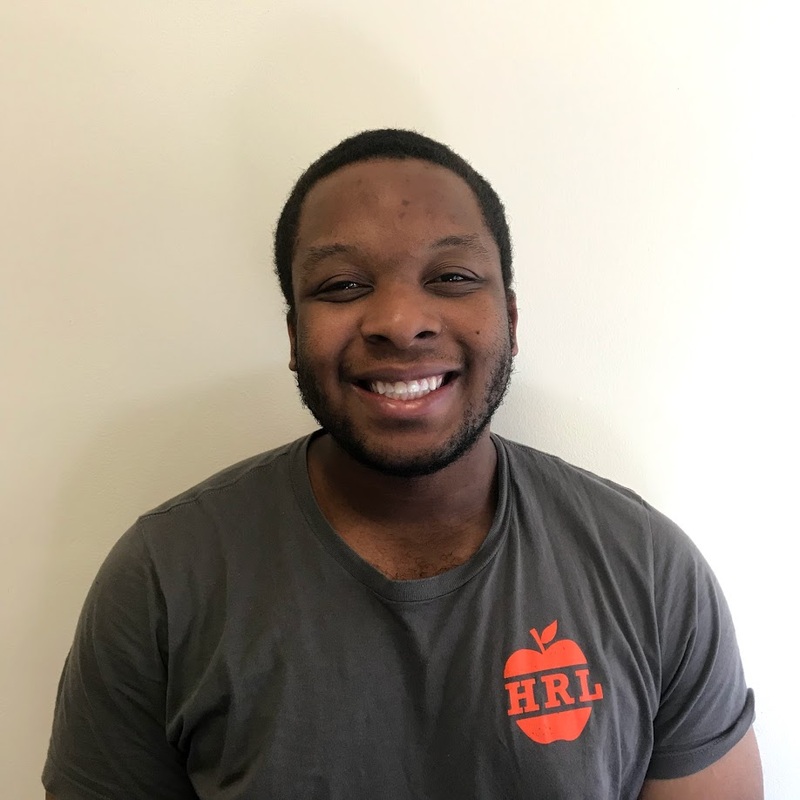 An undecided Sophomore business major, Ryan prides himself on his involvement with the Martin Luther King Student Association and the Multicultural Advisory Committee. If you ever need to find Ryan, he says he is most likely hanging out in the Boland Lobby getting to know a new resident he hasn’t met before. Ryan recalls wanting to be an RA as early as his Junior year of high school when he was brainstorming with his aunt about ways he could afford college. Although Ryan appreciates the financial benefits of the position, he believes the bigger payout is the leadership experience and the community he gets to be a part of in Boland Hall. Originally placed on the alternate roster, Ryan encourages anyone who is placed as an alternate to accept the position because you never know what could happen. Ryan’s tips for interested in becoming a Resident Assistant? Like Teresa, he says to be yourself throughout the entire selection process. He also wants to make sure that his future colleagues know what they are signing up for, so understand all the job entails and make sure you can be 100% committed to all aspects of the position. Housing and Residence Life is hosting four more information sessions throughout December and January for students interested in learning more about the RA position! Check out our previous blog post about RA selection to get those dates. Author Eric MochnaczPosted on November 17, 2017 December 15, 2017 Categories RAsTags aquinas, boland, complex, freshmen, Housing, Housing Application, ora manor, Parents, RA, RA Selection, residence halls, Resident Assistant, summer housing, xavierLeave a comment on Meet Teresa and Ryan, November’s Featured RA’s! HRL Staff reserves the right to enter your room to conduct health and safety inspections. These usually occur twice a semester but can occur as deemed necessary by the HRL professional staff. Your RA will enter your room, whether or not you or your roommate are there, and will be escorted by a professional staff member – either an RC or an RHD. They will look for any violations of our Health & Safety Policy and will confiscate and store any items that are in violation of our regulations. Any violation may result in documentation and a judicial hearing. If you have any questions, please speak with your RA or your RHD.